Vidura successfully brings the Kauravas and Pandavas together (shown). Yudhishthira rules the empire for 15 years. Ashramvasik parva describes those 15 years, followed by 2 years of Sannyasa by Kunti, Dhritarashtra and Gandhari in Vyasa's hermitage. Ashramvasik Parva (Sanskrit: आश्रमवासिक पर्व), or the "Book of Hermitage", is the fifteenth of eighteen books of the Indian epic Mahabharata. It traditionally has 3 sub-books and 39 chapters. The critical edition has 3 sub-books and 47 chapters. Ashramvasik Parva describes 15 years of prosperous rule by Yudhishthira after the great war. The Pandavas and Kauravas have lived in peace, with Yudhishthira consulting with Dhritarashtra on matters of governance. 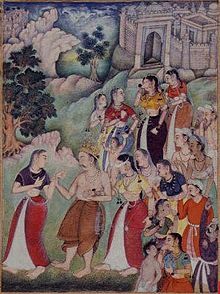 Draupadi becomes friends with Gandhari, Vyasa and other sages visit the kingdom with their fables and wisdom. The parva recites the next two years when Dhritarashtra and Gandhari take Sannyasa and live a hermit's life in a forest. This sub-book describes the 15 years of prosperous rule by Yudhishthira, followed by the departure of Kunti, Dhritarashtra and Gandhari to Vyasa's hermitage for sannyasa. This sub-book recites the visit of Pandavas to meet Kunti, Dhritarashtra and Gandhari at the hermitage. In the forest on the request of Gandhari, Kunti & other women, sage Vyasa with his powers, resurrect the dead warriors of Kurukshetra war for one night. It also mentions Vidura and his death. This sub-book describes the death of Kunti, Dhritarashtra and Gandhari. Narada visits to console those in grief. Yudhishthira performs cremation rites for all of them. The parva describes the 15 year rule by Pandavas with Yudhishthira as the king. After 15 years of peaceful co-existence, Dhritarashtra and his wife seek sannyasa (renunciation of domestic life for moksha). They leave the kingdom and head into the forest to Vyasa's hermitage. Yudhishthira attempts to dissuade them, but they insist on completing their fourth period of ashrama life. Kunti, Sanjaya and Vidura join them in the hermitage. Vidura was the first to die. After two years of hermit life, all three - Kunti, Dhritarashtra and Gandhari - too pass away, in a forest fire. The news of their death causes grief to Pandavas and citizens of the kingdom. Sage Narada appears and consoles them. Yudhishthira performs Shraddha rites for those who had died at the hermitage. Ashramvasik Parva was composed in Sanskrit. Several translations of the book in English are available. Two translations from the 19th century, now in the public domain, are those by Kisari Mohan Ganguli and Manmatha Nath Dutt. The translations vary with each translator's interpretations. Debroy, in 2011, notes that updated critical edition of Ashramvasik Parva, after removing about 30% of verses generally accepted so far as spurious and inserted into the original, has 3 sub-books, 47 adhyayas (chapters) and 1,061 shlokas (verses). Let thy judicial officers, O Yudhishthira, inflict punishments on offenders, according to the law, after careful determination of the gravity of the offenses. All creatures appear from an invisible state, and once more disappear into invisibleness. If it is done with the body, its consequences are to be enjoyed, or endured, in the body. This page was last edited on 8 January 2019, at 19:00 (UTC).